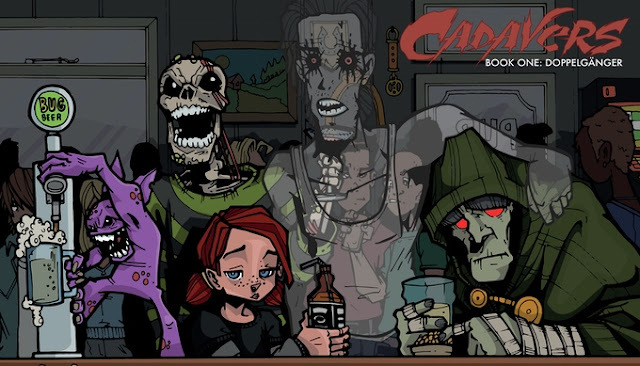 Taking a look away from the pages of books, Altered Instinct dives into the pages of a few comic books of recent times, starting with Cadavers, from Mad Robot Comics. Cadavers is the new comic from Mad Robot Comics, whose Madhouse comic I so thoroughly enjoyed last year. The Cadavers crew - the cast, not the creators - are a bunch of spooks and spectres and critters with paranormal powers, and the first issue focuses on the one who feels of least use to the crowd, Doppleganger. When not lurking in the pub or discussing politics, the crew moves to take action against those who would subjugate them now that they are a part of functioning society. Yup, this is a world where grabbing a drink at the pub might just make you cautious about asking for spirits. With cracking art by Ed Bentley, the story unfolds in two parts really - one part where the team swings into action intercut with discussions back at the bar. Their plan is a little ill thought through, though, as things begin to unravel. It's a thoughtful read, and kudos to Matt Hardy for interweaving politics which sadly resonate with current events without being too heavy handed. The action zips by - although with one stray moment where I wasn't entirely clear what was going on. 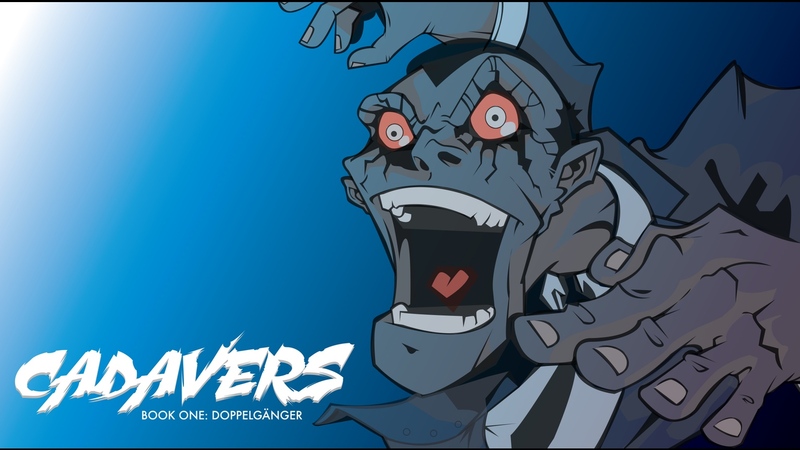 That didn't hold the comic back, though, or derail the storytelling, and Doppleganger's face shifting powers are a source of confusion aplenty for his opponents anyway. It's a strong start for the comic and I'll be keen to read issue two - for which a Kickstarter is running. 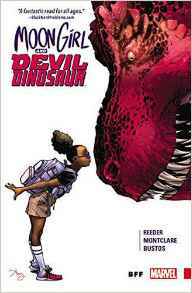 I used to love Moon Boy and Devil Dinosaur - so when Marvel had a bargain offer recently on the first volumes of a selection of their recent titles, I was tickled pink to see the big beastie had been given a reboot. This time, he has a new companion - Lunella Lafayette, a pre-teen genius stuck in school and fretting about the Terrigen mists of the Inhumans until time travel weirdness lands her hanging from the teeth of Big, Red and Roary. Tumbling through the timewarp along with Devil Dinosaur are a bunch of Moon Boy's rival little furry humanoids, who proceed to cause havoc while moving in on the territory of the Yancy Street Gang and anything shiny they happen to find along the way. The trouble is, it all feels so thrown together. Lunella isn't convincing at her supposed age, and the scrapes she gets into feel manufactured - while somehow she has a secret lab stashed away too. The time travelling humanoids come across as being stuffed in there because Lunella needs some source of conflict, but it's all very unconvincing. Throw in an obligatory guest appearance from another title - Hulk, in this case, picking a fight for no apparent reason other than to feature in the comic - and it's all a bit weak. Which is a shame, because there's potential here. 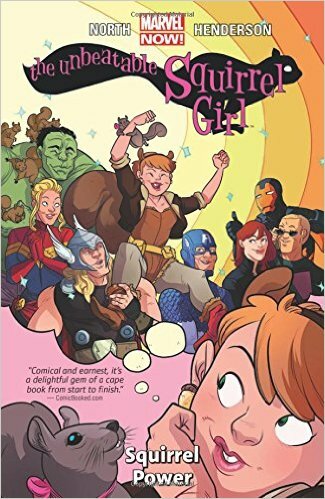 I've long loved Squirrel Girl as a splendid slice of sillyness in the Marvel Universe, and Ryan North really hits the ground running with the first volume of this series. Singing the Spider-Man song but with Squirrel Girl lyrics, our erstwhile heroine quickly takes care of some minor ne'er-do-wells as she takes centre stage. Our delightful Doreen is off to college, and the misadventures in roommates and in love are balanced nicely alongside the occasional need to save the world from Galactus. Yes, Galactus, the guy who chomps planets. What can a hapless girl with squirrel powers do in the face of overwhelming power? Hey, this is Squirrel Girl, she's unbeatable. Light and fun in all the right ways, and yet with moments of surprising thoughtfulness and substance, this is a smashing read. If ever Squirrel Girl has been on your radar, then to miss out on this would be... nuts?